On the evening of March 15th, a devastating Yonkers apartment fire tore through a 6 story residential building at 1 Hawley Place in Yonkers, NY. LoHud.com and other major news publications reported on the fire, which at the time of reporting was believed to have been started by a tenant smoking in bed. Tragically, this tenant lost his life in the blaze. Due to the extensive fire and water damage, all the tenants of the building were displaced and forced to leave the building for temporary housing in the vicinity of the building. Flames broke out before 4 a.m. in the six-story building at 1 Hawley Terrace. 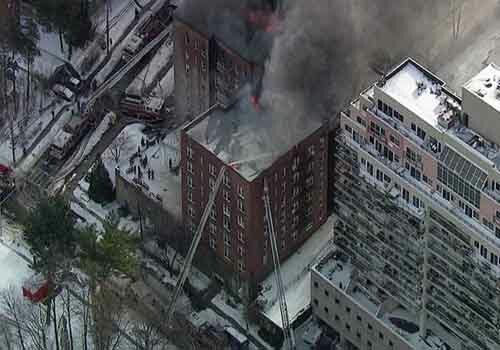 Flames could be seen shooting out of a sixth-floor window as residents were whisked away to the Yonkers Police Athletic League, where Red Cross volunteers were helping displaced families. Josh Lockwood, CEO of the Red Cross Greater New York Region, said more than 100 people were displaced from the 52-unit building, and that the PAL will likely be used as a temporary shelter overnight. After that the Red Cross will take it day by day to help the residents. “Folks here are emotional. Shocked. They’re really leaning on each other,” he said.